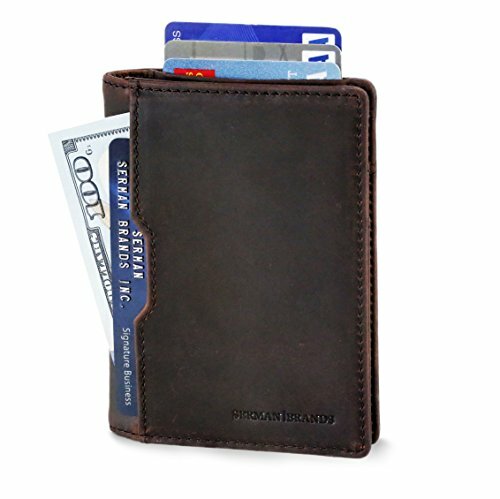 Wallets for Men Slim Mens leather RFID Blocking Minimalist Card Front Pocket Bifold Travel Thin (Texas Brown 5.0) | What Should I Say? SERMAN BRANDS is a team of free thinkers with varied disciplines from design, engineering, marketing and finance. Together, they share their diverse strengths and united passion of creation to bring to you NEW life-easing everyday must haves. "We love all things beautiful, functional and well crafted. Today there's a growing community of people who appreciate and hunt for this union of solid functionality, minimalist style combined with great craftsmanship made from honest materials. We believe that these are the core value of our creations and customers.